SpaceX and Tesla CEO Elon Musk said last month that the perfect way to heat Mars for human habitation is by dropping nucelear bombs on it; recently, he extrapolated on that plan. The best villains, whether in literature, films, comics, or video games, are the ones with the good ideas. The evil geniuses or warlords who are striving to bring peace to the world; or whose grand schemes do a lot of good, even if the methods themselves are morally dubious. 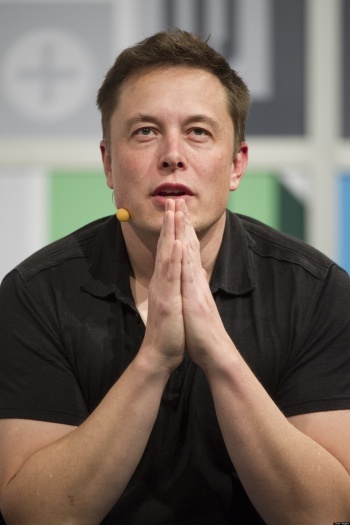 Enter Elon Musk, CEO of SpaceX and Tesla and all-around Tony Stark kind of guy - or maybe a Lex Luthor. In an interview last month with Stephen Colbert, Musk was talking about the future of human habitation on Mars. He says one key piece of the puzzle is warming up the red planet - and how does he suggest we do that? By dropping nuclear weapons over the poles. More recently, he explained the plan a little more at an event in New York City. "What I was talking about," said Musk, "was having a series of very large, by our standards, but very small, by calamity standards, essentially having two tiny pulsing suns over the poles. They're really above the planet. Not on the planet." "So if you have two basically tiny suns over the pole that would warm up the planet," he went on. "Then you would gasify frozen carbon dioxide, thicken the atmosphere and warm up the water and all of that would have a greenhouse effect. Have a cascading effect to continue warming up the planet." Eventually, the planet would continue to warm itself. Musk has also famously said, "I would like to die on Mars - just not on impact." Of course, what he is describing would actually work; who knows how long it would take, but if we were ever to terraform Mars, heating it up and forming an atmosphere are two important steps. But we still don't know enough about Mars. We've only just confirmed it has flowing water. There may be life on Mars (including Matt Damon) - probably nothing huge, very likely non-sentient microbes if anything - that would be affected by two nuclear explosions over the poles, and the subsequent heating that occurs. I guess the question we need to ask ourselves is this: is Mars going to be a nature preserve? Or is Mars going to be our second home? Doesn't seem likely that we can have it both ways.